I agree with you Charlotte. This is why I shared my post on Election Reflections. Thankfully, God's kingdom can NEVER be stopped and He is so much more powerful than the prince of the air. We can rejoice in that! Many are grieving, mourning, weeping for our country. My post is to encourage myself and others. We trust Him, and believe He in control. I look at it through the eyes of End Times.Maybe divine providence. I agree, Charlotte. I have decided that I need to be praying for the current administration, but I am still trying to pull myself up by my bootstraps this week. Oh dear Charlotte, I feel for you. But yes, we do have to accept the fact that "in the last days, perilous times shall come"; and "evil men and seducers shall wax worse and worse, deceiving, and being deceived." We are in the last days, but our hope, our joy, is the coming of our Lord. Our redemption draweth nigh! Many of us were disappointed, and the outcome was due to the many who want a free bowl of pottage and have sold their birthright. Already businesses are closing and laying off workers because they know they cannot survive the new laws and rules impossed upon them. We must pray that our leaders receive a NEW HEART and receive Jesus. Praise God that He is still on the throne! The outcome of this election must have been His will for the U.S. or He would not have allowed it -- sadly, I fear it is for our judgment. Throughout the Old Testament, Israel got the rulers they deserved; not necessarily those who had the best interests of the nation at heart. Thanks for sharing your thoughts and for hosting, & God bless. "I know that you can do all things, and that no purpose of yours can be thwarted." We take council from God's Word. 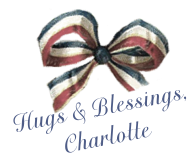 Hello Charlotte, it's the first time that I have visit your site and after my first reading of your article "Welcome Friends" I must say that I thinking the same way as your about the new elected president. You see I'm also christian and all this stuff about abortion and gay marriage is not what need to change, so we can leave like it is and our economy must change so he can concentrate on that topic...! I will bookmark your site and come back soon. Thanks to share your thoughts...! Oh, Charlotte, we keep saying we should not be surprised as things continue to get worse, but we still are. Nuts. One step after another. It's enough. Thanks for providing a place for all of us to share and have our say.